A Text Message from Mr. Haydn: “Nein! 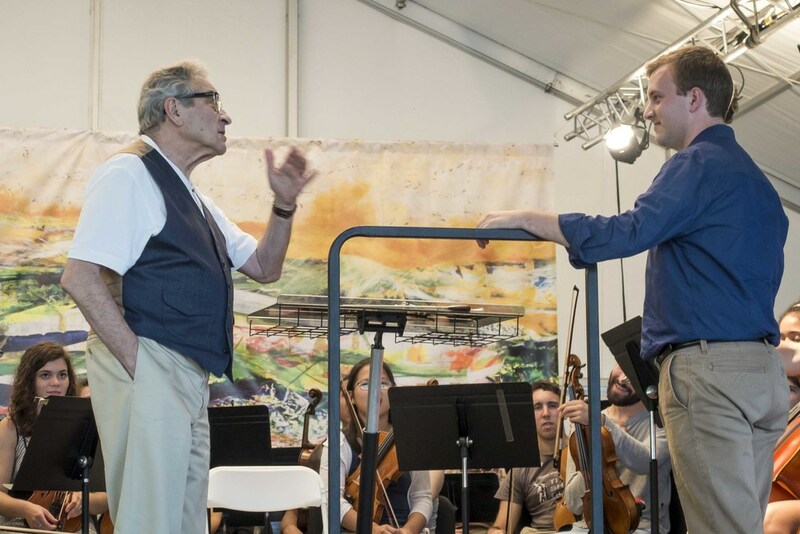 You haven’t got the spirit of the music!” How often such messages were relayed by Maestro Victor Yampolsky, famed conductor and instructor from Northwestern University, to six competitively chosen young conducting students as he and Artistic Director Erin Freeman led the first session of the week-long world premier of the Wintergreen Performing Arts Conductors’ Summit during the 2015 Summer Music Festival & Academy…. In that session, the students demonstrated their fledgling skills, taking turns conducting the joint orchestra of the String Chamber Academy and 2015 Fellowship Quartet in their first reading of The Seven Last Words of Christ, a rarely performed work by Haydn. Mr. Haydn, channeled through Maestro Yampolsky, also argued that “a preacher’s face” rather than a happy conductor’s face was more appropriate to the music, or that a gesture like an 8-cylinder Cadillac was not appropriate to signal a small change in sound, or that “you can’t Google it” to get the strong will that a conductor needs to show the musicians that he’s in charge. How Haydn could have known about Cadillacs or Google was not explained…. Victor Yampolsky and Dan Whisler take a deeper look into the music. Photo credit: Lewis Dunn. Nevertheless, the students survived that evening’s two sessions of twenty minutes each of practice conducting—an exceptionally generous period of conductor training. The sessions were video-taped, as would be all their practices, and were provided to the students at week’s end. 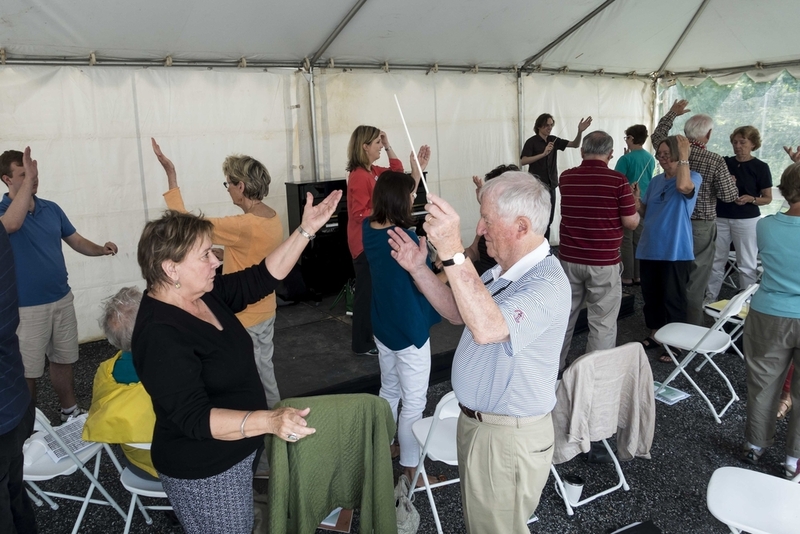 The student conductors also had four sessions, closely monitored by Yampolsky, conducting and rehearsing ensembles of professional Wintergreen Festival Artists in preparation for a Sunday morning public concert. Notably, there were fewer and fewer text messages from Mr. Haydn as these sessions continued. Perhaps most instructive of all were the three “how to” lessons when the students observed Maestro Yampolsky conduct rehearsals of the Wintergreen Festival Orchestra playing the Tchaikovsky, Mozart, and Mendelssohn to be heard at the weekend Classics Concerts. Add in sessions with the Artistic Director on public presentation and audience engagement, and the young conductors were well prepared for Sunday. At that concert, appropriately entitled The Future of Conducting, the six students skillfully presented themselves and described to the audience important musical and historical facts about the pieces by Beethoven, Stravinsky, Britten, and Spohr that they would conduct. For instance, the audience learned that Spohr, a Beethoven contemporary only now resurfacing in the music world, was in his time considered “better than Beethoven”. 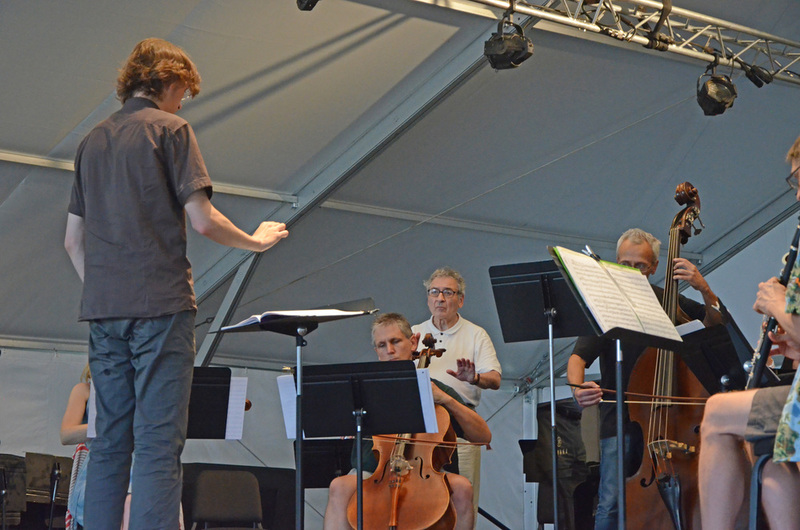 At the concert’s conclusion, the audience loudly applauded the six young conductors as together they took their bows across the stage in the Dunlop Pavilion performance tent. 3. 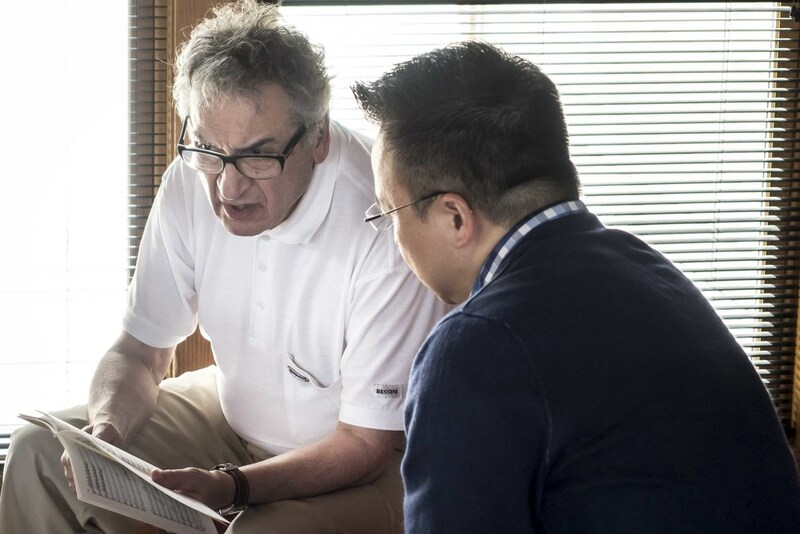 Victor Yampolsky and Mark Tse dive into a score during rehearsal break. Photo credit: Lewis Dunn. 4. Deanna Tham leads Wintergreen Festival Artists in music of Beethoven. Photo credit: John Taylor.